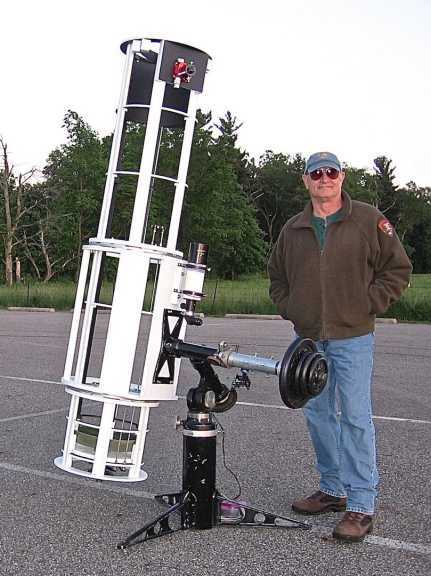 My name is Larry Silvestri, and I have been an amateur astronomer for almost all of my 68 years. I made my first telescope at the Adler Planetarium in 1962 and made a few more since then. I have also been visiting the National Parks for much of that time. At every opportunity, I have looked up at the night sky, and very often, I slept under the stars. Recently, I had the pleasure of working as a radio dispatcher for the National Park. The first sentence of the National Park Mission Statement declares, "The National Park Service preserves unimpaired the natural and cultural resources and values of the national park system for the enjoyment, education, and inspiration of this and future generations." They do understand very well that the night sky is a natural and a cultural resource. They are also trying to educate the public about, not only the stars and planets, but also about light pollution. The National Park Service is dedicated to protecting the night sky. Preserving that resource "unimpaired" is a goal that requires everyone's assistance, not only within the parks, but also throughout the surrounding regions. This year the National Park Service turns 100 years old, and the Indiana Dunes National Lakeshore will turn 50. In celebration, the Park Service has invited all amateur astronomers to show the night sky to the public. This program began in November 2015, and it will continue on every first Saturday through November 2016. We meet at the Kemil Beach Parking lot, a few miles between Chesterton and Michigan City, Indiana. Although the Indiana Dunes sky is not as pristine as the Southwest deserts, it is among the least light polluted within the 30 miles from the Adler. I have attended every First Saturday Stargaze, and I can say that it has been very popular. We also have had some very good luck; every first Saturday has been clear. There have always been from twenty to fifty visitors, and we have always managed to show them many objects; planets, star clusters, double stars, nebula, galaxies, meteors, and the Milky Way. The first Saturday gatherings start at dusk. The Kemil Parking lot is easy to find. Take I-94 south from the Adler into Indiana. Get off at the Chesterton Exit 26B and go north 1.8 miles. Merge onto Dunes Hwy/US-12 via the ramp on the left. Go under the bridge, and head east about 3 miles to the first left turn. (Look for the red direction arrow and star.) Go north about 0.9 miles and the parking lot is on the right. I hope to see you there!